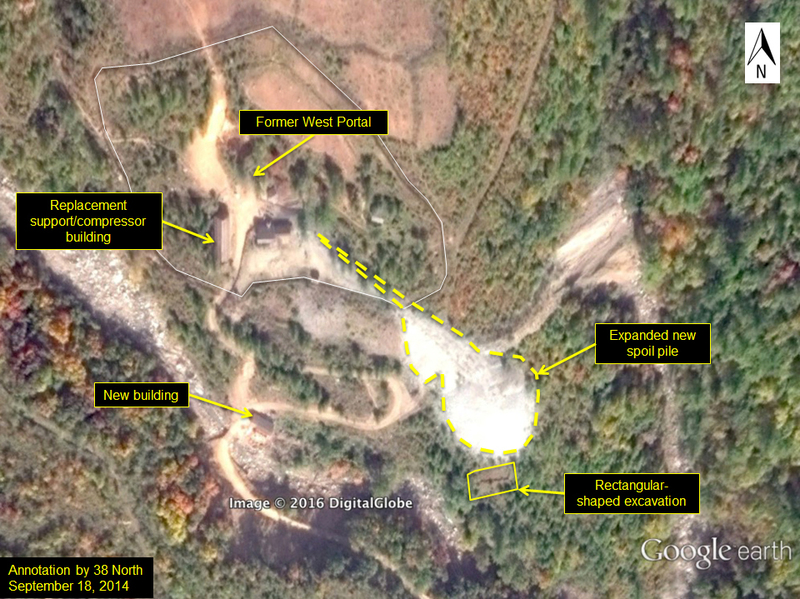 Commercial satellite imagery of the Punggye-ri Nuclear Test Site shows that substantial tunnel excavation is continuing at the “North” Portal (previously the “West” Portal), which provided support for the last four of the five declared underground nuclear tests conducted by the Democratic People’s Republic of Korea. The North Portal tunnels provide direct access under Mt. Mantap, where up to 800 meters of overlying rock is available for test containment. This locale provides the maximum overlying rock possible within the entire test site and is where the most recent and largest detected test occurred on September 9, 2016 (estimated at 15-20 kilotons yield). The continued tunneling under Mt. 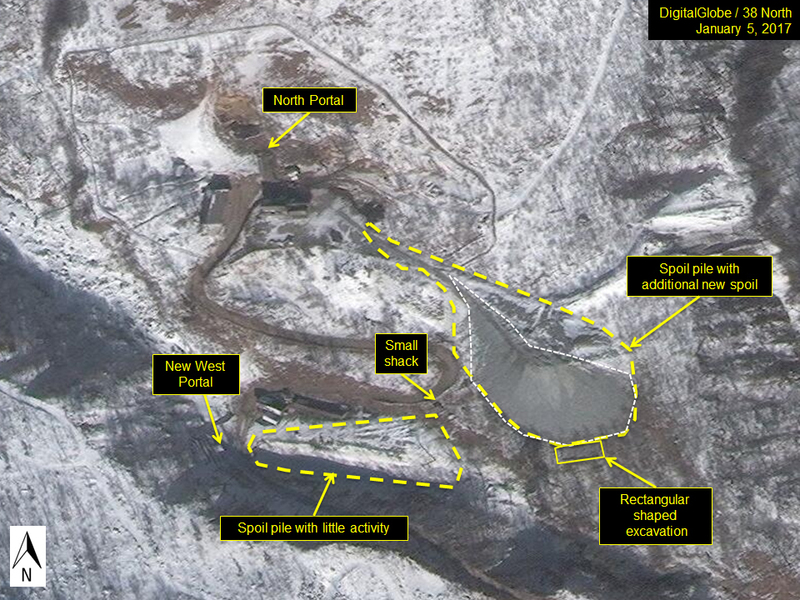 Mantap via the North Portal has the potential for allowing North Korea to support additional underground nuclear tests of significantly higher explosive yields, perhaps up to 282 kilotons (or just above a quarter of a megaton). In a recent article, we discussed the yield progression of the five acknowledged underground nuclear tests at the Punggye-ri Nuclear Test Site and the general lack of associated observable surface disturbances until the most recent one. The tests have generally been increasing in explosive yield, from the first test on October 9, 2006, which had an estimated yield of less than one kiloton equivalent of chemical explosives, to the latest test on September 9, 2016, which had a yield of up to 20 kilotons. Several independent seismological teams (in China, South Korea and Norway) have very precisely geolocated the last four tests in the same region near Mt. Mantap, with the most recent test directly under Mt. Mantap (See Figure 1). A study by another South Korean team, using Interferometric Synthetic Aperture Radar (InSAR) data, provided an empirical basis from which to corroborate those geolocations. It is most likely that a complex horizontal tunnel network, accessible via the “North” Portal (previously designated by outside observers as the “West” Portal), supported these four tests and is in the same general location where additional tunneling is now ongoing. The North Portal is also the only portal within the test site to have an encompassing security perimeter fence, further emphasizing its current role as the primary test portal. Figure 1. Event locations (approximate) vis-à-vis tunnel portals with conjectured tunnel projections. Image © Google Earth 2017. There are three other tunnel portals located within the test site: the “East,” “South” and the new “West.” (“new” because it is a bit west of the original “West” Portal that has been re-designated by those same observers as the “North” Portal). Prior to the first test in 2006, only two tunnel portals (entrances) were present within the Punggye-ri underground nuclear test site. Large piles of excavated rock spoil were already present outside and downslope from each of those two portals since at least February 14, 2005 (using Google Earth archive imagery). Following its employment in support of the first underground nuclear test in September 2006, the East Portal was abandoned (most likely due to the post-test radionuclide release). The next two tests (in May 2009 and February 2013) involved the use of the tunnel accessed by the North Portal. Figure 2 shows the North Portal and the spoil pile, accumulated from material excavated to create that tunnel, as it appeared during the time of the 2013 test. Figure 2. The extent of the original spoil pile of accumulated rock that was excavated pre-2006 for the tunnel used in the emplacement of the nuclear test devices used in 2009 and 2013. New excavation activity for a third tunnel, located in a southern portion of the main nuclear test site, was observed on commercial satellite imagery on October 8, 2009. That new tunnel area has been since labeled by outside observers as the “South” Portal. Tunnel excavation at the South Portal continued for several years with one hiatus due to massive flooding that washed away most of the spoil pile in mid-July 2013. The excavation may have also involved a smaller adjacent ancillary tunnel. Since that time, there has been minimal new tunneling activity near the South Portal. Currently, the South Portal is likely to be fully operational and capable of supporting a future underground nuclear test. However, to date, it has not been used for a known nuclear test. Excavation for a fourth tunnel, the new “West” Portal, has been underway since mid-2015. It has also undergone some improvements including terracing above the tunnel entrance in early 2016 for earth stabilization. While clearly an operational site, it is not yet possible to determine the status of that tunnel regarding its readiness for future underground nuclear testing. 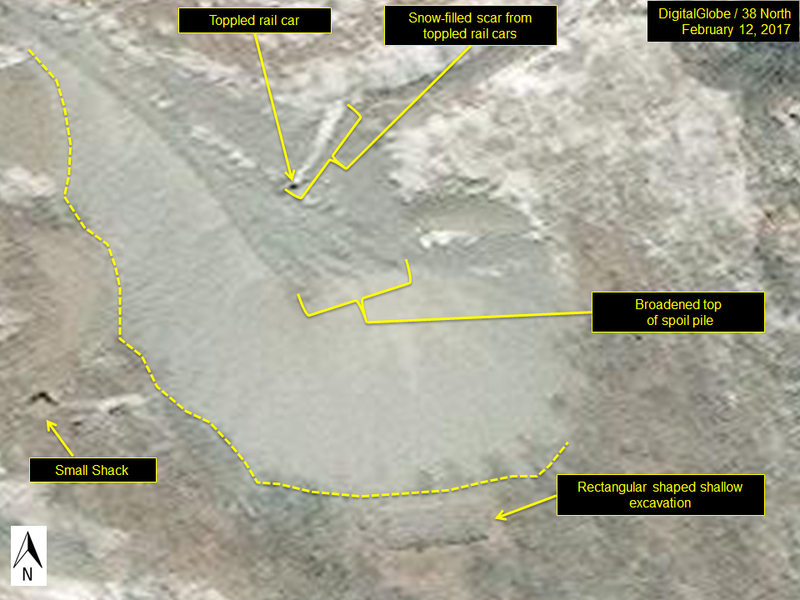 Roughly six weeks after the third DPRK underground nuclear test (February 12, 2013) involving the North Portal, excavation was observed nearly coincident with a radionuclide detection associated with that test. At about the same time that the radionuclides were detected, additional activity in the form of new tunnel excavation and spoil dumping had already begun at the North Portal. See Figure 3. It is also possible that the radionuclide release led to some form of site contamination, because in April 2014, two support buildings nearest the tunnel entrance were removed entirely. One building had previously served to conceal the tunnel entrance (it was not replaced) and the other was a support/compressor building, which was completely reconstructed. In any case, it seems that a second, entirely new, test support tunnel had begun to be excavated very close to the same starting point as the original entrance in the North Portal area, creating a new spoil pile. More spoil has been excavated from tunnel construction in the North Portal tunnel complex than from any other portal within the Punggye-ri nuclear test site. Figure 4 shows the continued expansion of the new spoil pile from a new tunnel under Mt. Mantap accessed via the North Portal in September 2014. Figure 5 shows not only the continued expansion of the North Portal spoil pile in advance of the two 2016 tests, but also the progress on another new tunnel being excavated nearby at the West Portal. The North Portal spoil pile is teardrop shaped in plan view with steeply sloping sides measuring approximately 100 meters long by about 40 meters wide. Figures 6-8 show how the spoil pile at the North Portal has steadily progressed in size since late October 2016 vis-à-vis a small shack and small shallow rectangular excavation located just west and south of the furthest extent of that spoil pile. Figures 9 and 10 makes that progression westward and a broadening at the top of the pile more clearly visible in a close-up view. Figure 3. Coincident with, or shortly after, radionuclides were detected and traced back to the February 2013 test, a new tunnel began to be excavated from the same point as the previous tunnel at the North Portal. Figure 4. The spoil pile from the new tunnel excavation at the old West Portal (now “North” Portal) continued to expand through 2014. Figure 5. 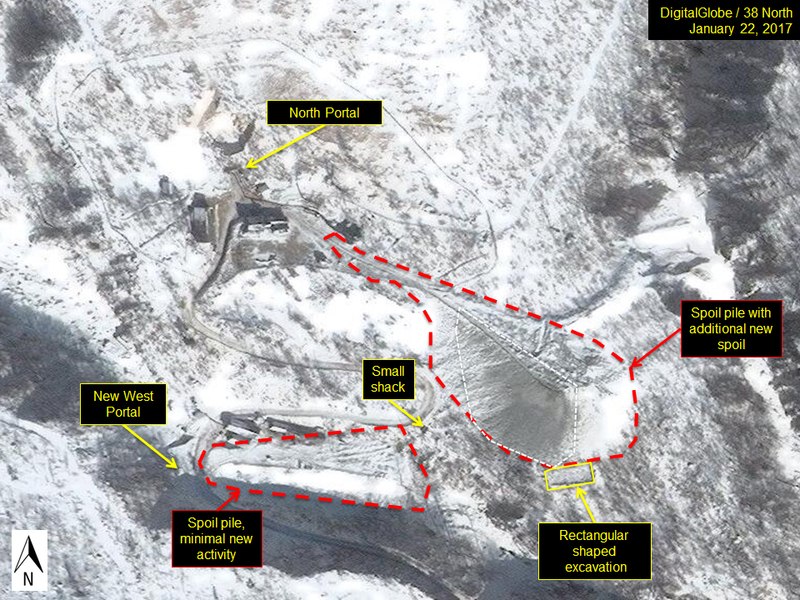 The spoil pile continued to expand through late-2015 in advance of the first of two underground nuclear tests in 2016 involving the North Portal, while another tunnel began to be excavated nearby at the new West Portal. Figure 6. Following the most recent of five underground nuclear tests, excavation continued underground in the North Portal area suggesting more tests to come in the same tunnel complex directly under Mt. Mantap. The tunneling at the new West Portal seems to be on hiatus. Figure 7. The North Portal spoil pile continued to expand into 2017, becoming increasingly broader. Figure 8. Late January 2017 imagery showing new spoil on top of recent snow. Figure 10. A close-up of the North Portal spoil pile from February 2017 shows that accumulations had begun move westward with a broadening of the top and bottom west side of the pile. A small shack and a small shallow rectangular excavation serve as positional reference markers for temporal comparison with Figure 9. Implication 1: A previous analysis had claimed that the Punggye-ri Nuclear Test Site was effectively yield limited such that the largest containable test was in the range of “only a few tens of kilotons.” Our analysis is the first to show that Punggye-ri is capable of hosting tests having yields into the hundreds of kilotons using only horizontally excavated tunnels. When we apply the parameters found for Mt. Mantap (which provides 800 meters of overlying rock for a tunnel beginning at the North Portal), to published nominal scaled depth of burial formulae (approximated by the equation: Depth=122(yield in kT)1/3, where depth is measured in meters and yield in kilotons (kT)), then such a depth would allow containment of an underground nuclear explosive event having a yield of up to 282 kilotons. They wanted greater assurance of full and safe containment of each test that over-burial might be thought to provide. Additional evidence of over-burial can be drawn from both the lack of significant associated observed surface disturbances and because there has been only one remote radionuclide detection subsequent to the last four tests involving the North Portal. 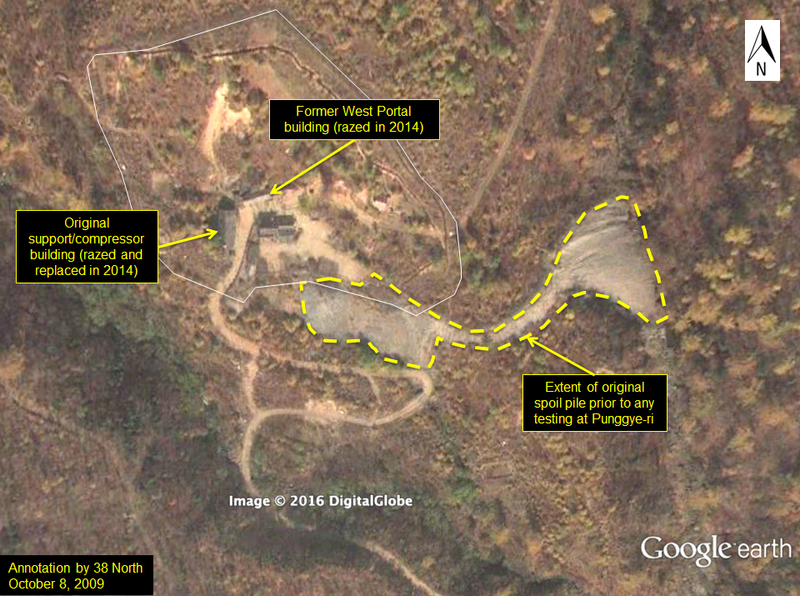 North Korea has conducted five declared, and remotely detected, underground nuclear tests over the past decade at its dedicated nuclear test site at Punggye-ri in mountainous terrain in the northeast of the country. Those tests have involved only two portal areas (of four excavated). The first test in 2006 involved the “East” Portal (since abandoned), while the four most recent tests (2009, 2013, and two in 2016) occurred via the “North” (old “West”) Portal at various locations under Mt. Mantap, which offers the greatest overburden onsite (up to 800 meters). 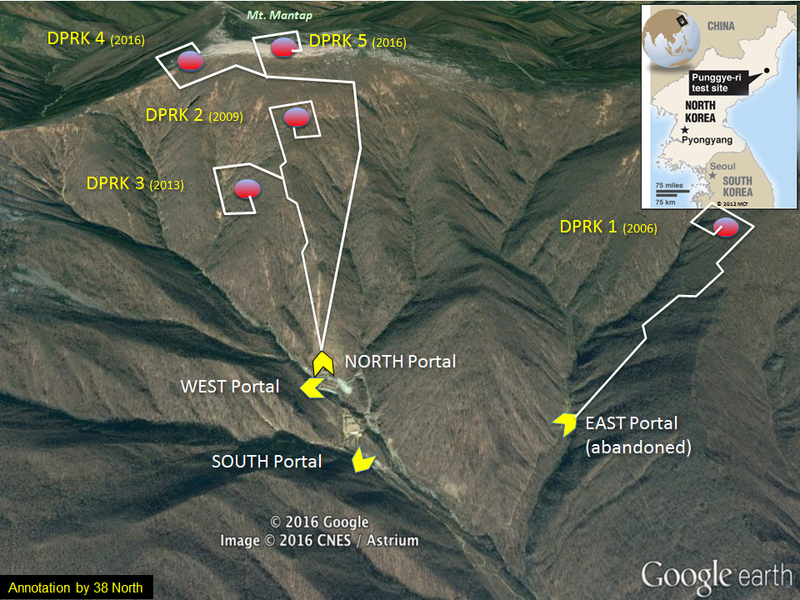 Just prior to the most recent test on September 9, 2016, all three operational portals exhibited some signs of activity. However, subsequent to that test, significant new tunneling activity has only been observed at the North Portal. In contrast, tunneling activity at the “South” and new “West” Portal had either been sharply reduced or already halted. This suggests that the North Portal will very likely continue to be used as the primary test location, possibly because it provides the greatest amount of overburden and would likely be the most capable of containing the largest possible explosive yields, potentially up to just above a quarter of a megaton. Siegfried Hecker, “What to Make of North Korea’s Latest Nuclear Test?,” 38 North, September 12, 2016, https://www.38north.org/2016/09/shecker091216/. Applying the nominal scaled depth of burial formula as published in the US Congress, Office of Technology Assessment, The Containment of Underground Nuclear Explosions, OTA-ISC-414 (Washington, DC: U.S. Government Printing Office, October1989), p. 52, http://www.princeton.edu/~ota/disk1/1989/8909/8909.PDF. Frank Pabian and David Coblentz, “Surface Disturbances at the Punggye-ri Nuclear Test Site: Another Indicator of Nuclear Testing?,” 38 North, January 6, 2017, https://www.38north.org/2017/01/fpabiandcoblentz010617/. Lianxing Wen’s Geogroup, “North Korea’s 9 September 2016 Nuclear Test Location and Yield: Seismic Results from USTC,” University of Science and Technology of China, (2016-09-10 08:15), http://seis.ustc.edu.cn/en/201609/t20160909_253323.html. “Report showing geo-location map by the Korea Institute of Geoscience and Mineral Resources (KIGAM) in South Korea,” Focus News, September 10, 2016, http://m.focus.kr/view.php?key=2016091000153354133. J. Gibbons; F. Pabian; S. P. Näsholm; T. Kvaerna; S. Mykkeltveit 2016; “Accurate Relative Location Estimates for the North Korean Nuclear Tests Using Empirical Slowness Corrections,” Geophysical Journal International, October 5, 2016, http://gji.oxfordjournals.org/content/early/2016/10/05/gji.ggw379.full.pdf?keytype=ref&ijkey=hpjnOR2ak0jA9bI. Min-Jeong Jo, Sang-Wan Kim, and Joong-Sun Won, “Measurement of Surface Deformation due to the 2016 Nuclear Test of North Korea Using SAR Interferometry,” a poster paper presented at the Fall American Geophysical Union meeting, San Francisco, CA, December 12-16, 2016, https://agu.confex.com/agu/fm16/meetingapp.cgi/Paper/159632. 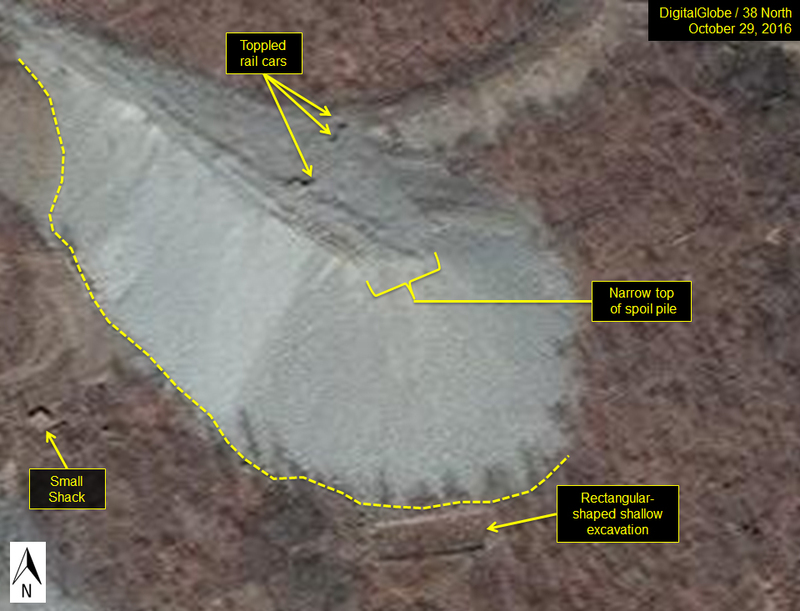 Note: Another InSAR based study provided additional corroboration for the location of the January 2016 test and concluded that “the estimated depth is 420–700 meters, and the cavity radius is 23–27 meters.” See: Meng Wei, “Location and Source Characteristics of the January 6, 2016 North Korean Nuclear Test Constrained by InSAR,” Geophysics Journal International, February 13, 2017, https://academic.oup.com/gji/article-abstract/doi/10.1093/gji/ggx053/2991072/Location-and-Source-Characteristics-of-the-January?redirectedFrom=fulltext. 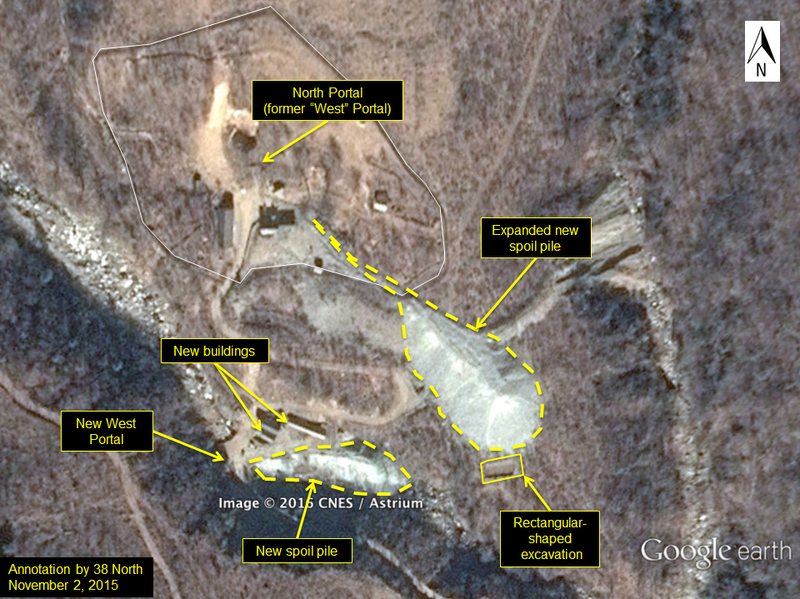 Jeffrey Lewis, “New Nuclear Test Tunnel Under Construction at North Korea’s Punggye-ri Nuclear Test Site,” 38 North, December 2, 2015, https://www.38north.org/2015/12/punggye120215/. According to a Comprehensive Test Ban Treaty Organization (CTBTO) report, “Two weeks after the event, the radionuclide noble gas station at Yellowknife, Canada, registered a higher concentration of Xenon 133. Applying atmospheric transport models to backtrack the dispersion of the gas, its registration at Yellowknife was found to be consistent with a hypothesized release from the event in the DPRK.” And, “…measuring radionuclide particles or noble gases in the air, is applied to provide ultimate proof of a nuclear explosion. Radioactive noble gases are of particular interest. Due to their ability to seep through layers of rock into the air, they would be the only evidence of a well-contained underground nuclear explosion. Dispersed by the winds, traces of noble gases would eventually be registered at a radionuclide station equipped with the relevant technology.” https://www.ctbto.org/press-centre/highlights/2007/the-ctbt-verification-regime-put-to-the-test-the-event-in-the-dprk-on-9-october-2006/. 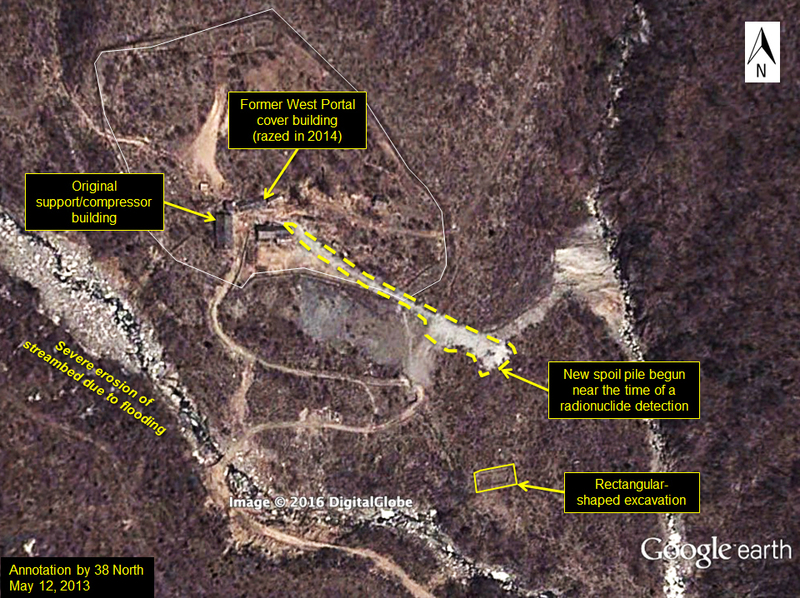 Nick Hansen, “Two New Tunnel Entrances Spotted at North Korea’s Punggye Nuclear Test Site,” 38 North, October 23, 2013, https://www.38north.org/2013/10/punggye102313/. This detected release could have resulted from either delayed (late-time) seepage through cracks in the event host rock, or from nearby anthropogenic activity such as drill back or re-entry within the emplacement tunnel. See https://www.ctbto.org/press-centre/press-releases/2013/ctbto-detects-radioactivity-consistent-with-12-february-announced-north-korean-nuclear-test/. Jeffrey Lewis, “North Korean Nukes 2.0?” 38 North, April 4, 2014. It has also been argued by some that even greater depths (e.g., more than 2000 meters) could be obtained through vertical shaft excavation, possibly at the end of the horizontal tunnels, to provide the potential for even higher yields. See: So Gu Kim, Yefim Gitterman, S. Lee, Václav Vavryčuk, Seoung-kyu Lee, “Depth determination and source characteristics of the North Korea Nuclear tests (2006, 2009, 2013 and 2016) using seismic arrays with azimuthal optium coverage,” American Geophysical Union Fall Meeting, December 12-14, 2017, https://agu.confex.com/agu/fm16/meetingapp.cgi/Paper/133602. US Congress OTA report, p. 52. See also: Samuel Glasstone and Philip J. Dolan, Effects of Nuclear Weapons, 1977, p. 261, https://nnsa.energy.gov/sites/default/files/nnsa/inlinefiles/glasstone%20and%20dolan%201977.pdf. For more on containment factors, specifically associated with the material properties of the identified host rock at the North Korean nuclear test site, please refer to Esteban Rougier, Christopher R. Bradley, Howard J. Patton, and Earl E. Knight, “Yield and Depth of Burial Hydrodynamic Calculations in Granodiorite: Implications for the North Korean Test Site,” 2011 Monitoring Research Review: Ground-Based Nuclear Explosion Monitoring Technologies, September 2011, http://www.dtic.mil/dtic/tr/fulltext/u2/a568918.pdf. Among the considerations include: material (rock) strength, burial depth, and separation distance between tests. The host rock under Mt. Mantap is thought to be a competent batholitic igneous basement rock of either diorite or granite. 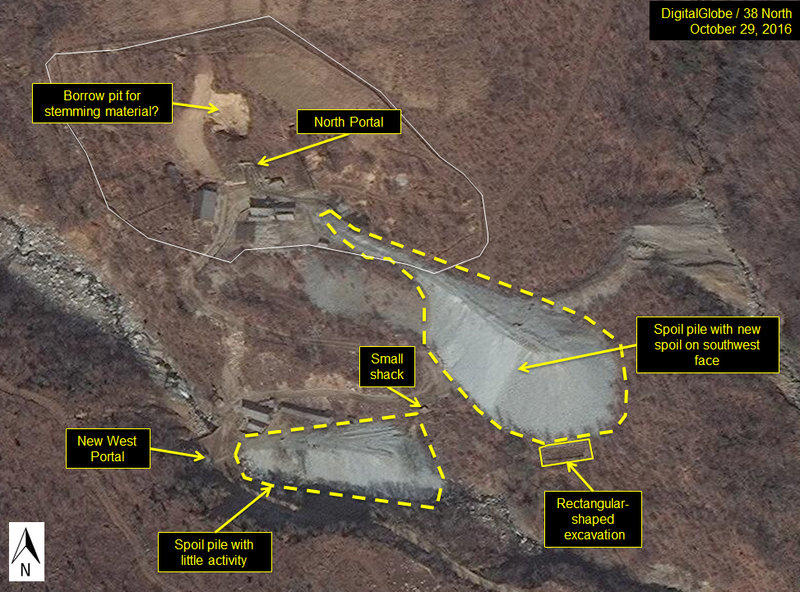 See David Coblentz and Frank Pabian, “Revised Geologic Site Characterization of the North Korean Test Site at Punggye-ri,“ Princeton University/Science and Global Security, Taylor & Francis, June 29, 2015, http://www.tandfonline.com/eprint/4PgZ4UQz5vZyWFTgY3kw/full. The burial depths can be derived from the surface elevation of the geolocation of each event minus the associated horizontal tunnel portal elevation. This detected release (coming 55 days after the 2013 test) could have resulted from either delayed (late-time) seepage through cracks in the event host rock, or from nearby anthropogenic activity such as drill back or re-entry within the emplacement tunnel. Given that tunneling activity was ongoing at the North Portal during that period, the latter possibility is the more likely.